Are you interested in being considered for the CDD team? If so, please check out the details below. I'm excited to have you apply. 1. Are willing and able to use clear photopolymer stamps, dies and other products I have in my shop. Most stamp sets include images, so you must be able to color those images.Being able to showcase CDD products is a must. 2. Have a blog or Facebook Fan page where you post regularly. Showcasing projects in well-lit, well taken photos is important. 3. You will be making an average of 6-8 projects a month which consists of regular DT projects along with releases. 4. Are active on Facebook and Instagram. Pinterest, Twitter, and YouTube are pluses, too! 5. Are able to comment on linky party entries and in the CDD Gallery on Facebook. 6. Are willing to participate in blog hops for Craftin Desert Divas. 7. Are not members of design teams for competing stamp companies (sentiments or images). 8. Are able to serve for at least 6 months, from July 2015- Dec. 2015. I have to choose a select number of designers to showcase my products. Because of this, I'm requesting that should you be chosen as a member of my DT, you not join or currently be serving as a design team member or guest designer for any other competitive stamp companies. If you are currently on another team, but your term ends within July/August time frame, please let me know when your term ends, so if you are selected there is no conflict of interest. 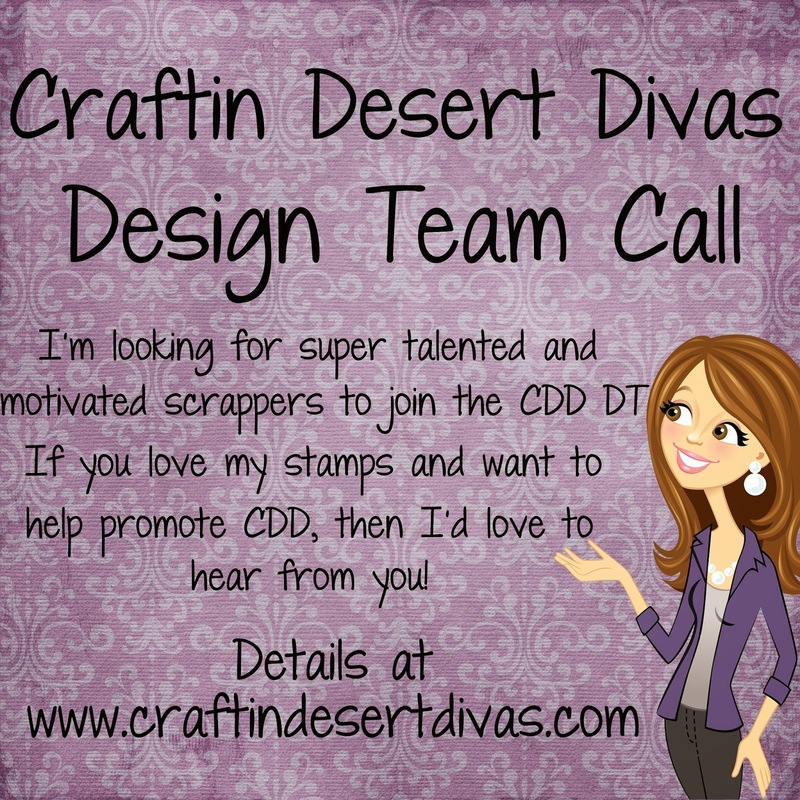 Design Team members will receive free stamps and discounts from the CDD Shop. 1. Choose 3 of your favorite projects. They can be projects you've created in the past or new ones you make just for this DT Call. Be sure you include projects that show off a range of your talents, including your use of stamps, coloring skills including any coloring techniques you use. Image and sentiment stamping are a must. Links to your blog, Facebook page and/or profile and Instagram account. Attach photos of your 3 projects (mentioned above). Include links to the blog posts of the projects, if applicable. Does not have to include CDD product but it doesn't hurt to show how you would showcase my product. Design team call will end May 24. When you say not a member of competitive stamp DT does this include any other stamp company or specific ones? Sharon- I prefer my DT members not to be on any other stamp companies DT. Hope this helps you. Thanks! is that specific to physical stamps or does it also include digital stamp companies as well? thank you for your response :) I will be putting in my application then!!! I will be announcing the dt in a few weeks and I will be contacting those who I'm interested in very soon. I'm the only one that will be seeing the entries as I had everyone email me.